As the 2016 BB&T Atlanta Open reaches the midway point, a lot of great tennis has been watched and played. We see the players coaches and chair umpires and for good reason, they have the spotlight, but there are a group of guys that work long hours and go virtually unnoticed. If not for them, the players would be playing with oversized bubble wands. In the back corner of the retail store, just behind the stadium court, is a small team of three men in Chuck Hakansson, Fabrizio Rivera, and Randy Gibson. These three are responsible for stringing every racquet you see in a player’s hand during the tournament and it's a task that can be very daunting at times. With close to 70 racquets being strung each day, and each one taking 15 to 20 minutes, the workload is not an easy one. Despite this, the gentlemen take pride in what they do and most of all; they enjoy it. 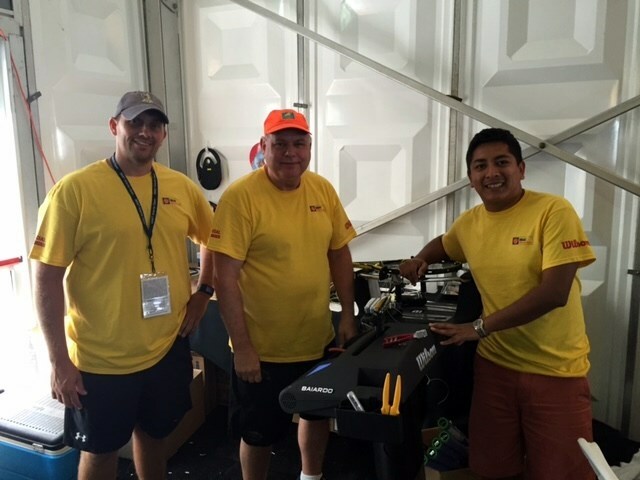 This is the first time the trio has worked the BB&T Atlanta Open, but they are not new to working with one another. In the past, they have worked the NCAA Tennis Championships, the Big East Conference tournament and even worked a tournament where more than 1,200 racquets needed to be strung. Experience is not something they lack, with around 60 years between them all. Chuck is the senior member of the team with 30 years under his belt. He started stringing after breaking strings at a tennis camp and talking one of the tennis pros into coaching him on how to string a racquet. The rest is history as he has earned spots at the U.S. Open and Australian Open as a stringer. Randy has been stringing racquets for 24 years. He has always enjoyed tennis and when strings began to break on a regular basis, he decided to invest his time on learning how to restring his frames. What started as something for his own benefit quickly grew as referrals to tournaments like the U.S. Open started coming to his door. Fabrizio could be considered the rookie of the team with only 6 years of experience, but if you ask Randy or Chuck, he is one of the hardest working people they know. It is that work ethic while working at the IMG Academy that earned him the chance to come here to the BB&T Atlanta Open. It’s easy to overlook what goes on behind the scenes at a big event, with so many moving parts and workers performing varied duties. Sometimes there are unrealistic deadlines and an abundance of requests for strings, but the team handles the pressure like true pros. Being the first ones in and sometimes last ones to leave the tournament site for the day, it's a pleasure to bring a little light to the gentlemen that play a part in the tennis you see on the courts.